Welcome to Forward Motion Massage in Pepperell, MA. Massage for the sake of healing. Professional Member of the AMTA since 2000. 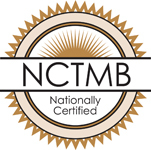 Nationally Certified in Therapeutic Massage and Bodywork since 2000. Bettyann Cernese is Nationally Certified Massage Therapist practicing since graduating in 2000. She holds a Bachelor of Science degree from Worcester Polytechnic Institute, is a graduate of the New England Academy of Therapeutic Sciences; the Jack Meagher Institute of Sportsmassage Therapy and is certified in sports massage for both horses and humans. She is also trained in Zero Balancing and is currently enrolled in the Zero Balancing Certification program. Over the past six years, Bettyann has been studying with indigenous healers from Mexico and West Africa. She is initiated as a Granicero (Weather Shaman) in the Nahuatl indigenous tradition of the highlands of central Mexico. This work includes energetic healing work, participation in seasonal rain rituals in Mexico and leading local Harvest Rituals in her own area. She has also done extensive work and study with Malidoma Somé in the indigenous healing wisdom of Africa. Bettyann takes an individualized and integrated approach to working with each person. She spends time listening to each client's needs and then draws on the many techniques she is trained in to provide a customized session for that client. During the 20 years I spent in the high tech industry doing everything from software engineering to sales and marketing I was on a search for what my life work should really be. After the passing of my mother, I received a massage for the first time and discovered it's powerful healing abilities on so many levels. A couple of months after this first massage I was enrolled at NEATS and 3 months after graduating I launched my own business as a massage therapist. What’s you favorite part of your job? Experiencing how the power of touch can enable the innate power of healing in each of us. My mother told me that I had the ability to do and be anything I wanted. What fascinates you most about the human body? The amazing ability to heal itself, if we just take the time to pay attention and listen to it's need. Being with my animals which include my dog Rowan, my horse Dora and my many cats. Doing most anything outside from gardening to snow shoeing. Skiing is a passion and I have been a volunteer member of the National Ski Patrol for more than 30 years. Where do you go to escape the office? Into the woods, on horseback, walking, cross country skiing or snow shoeing. A ritual of meditation and morning prayers.